Believe it or not, Valentine's Day is right around the corner. Regardless of what your plans may be: date night, Galentine's brunch, or just going about your workday, as usual- everyone can still be festive. While wearing a red shirt to the office is pretty standard, one’s makeup is the easiest way to have some fun on the day of love. With that being said, here is a list of long-wearing lipsticks that are perfect for whatever and wherever your Valentine's Day plans take you. Dose Of Color is well-known for their lipsticks and with excellent reason. Their Matte formula is a bit creamier than most. While you should exfoliate your lips when applying a matte lipstick, if you skip that step, this is a formula that leaves your lips not too dry for the majority of the day. Their shade, Los Anjealous, is a beautiful muted ruby red that is perfect for any Valentine's Day plans. The Colorstay Overtime Lipcolor from Revlon is a lipstick that stands the test of time. With a matte color on one side and a gloss on the other, this product will last from your morning coffee at work, to the glass of wine you have at dinner, leaving you a little of you on any glass you may drink from. The shade All Night Fuchsia is the perfect hot pink/purple to make any look stand out from the crowd. The berry mauve shade that is Unzipped is not only great for a simple Valentine's day lip but also one you can wear all the rest of the days of the year. The OFRA Long Lasting Liquid Lipstick is a creamy matte that doesn't leave lips too dry, and also has a pigment that will keep your lips looking brilliant. 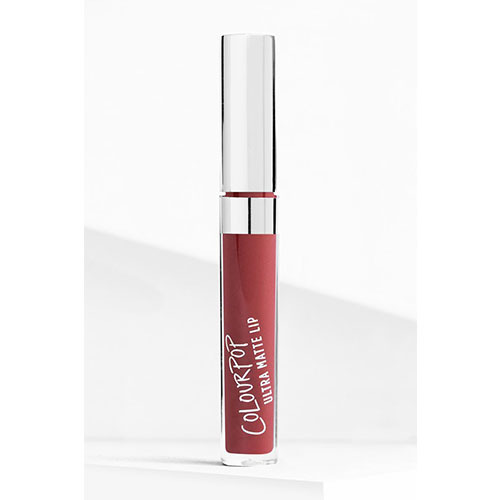 The Ultra Matte Lip from ColourPop has been a fan favorite in the beauty community for years! This formula not only has an intense pigmentation but has a lasting power that even some of the most high-end brand have yet to achieve. If you're more into vampy Valentine's looks, then the shade Avenue is the way to go. This bright rosy shade, accurately called Rose, is a great way to put some fun in your Valentine's look. The Opaque Rouge Liquid Lipstick form Hourglass is creamy, and while you may be wondering what this creaminess means the color will come off, you will be pleasantly surprised when you look at yourself in the mirror at night and see your lips still looking fierce.